After installing Exchange 2013 in production, there might be some HealthSets in an Unhealthy state. Note: The property “NotApplicable” shows whether Monitors have been disabled by Set-ServerComponentState for their component. Most Monitors are not dependent on this, and report “NotApplicable”. Let’s take a look at HealthSet “Autodiscover.Protocol” and why it’s in an Unhealthy state. We can see all appropriate Probes, Monitors, and Responders regarding the Autodiscover.Protocol HealthSet. The Monitor AutodiscoverSelfTestMonitor is in an Unhealthy state. An Unhealthy state will be transition within 600 seconds to Unhealthy. The ScenarioDescription parameter tells the administrator more details about the issue. “Validate EWS health is not impacted by any issues”. Actually not all protocols can be invoked manually with the Invoke-MonitoringProbe cmdlet. We hope Microsoft will fix this for the future. 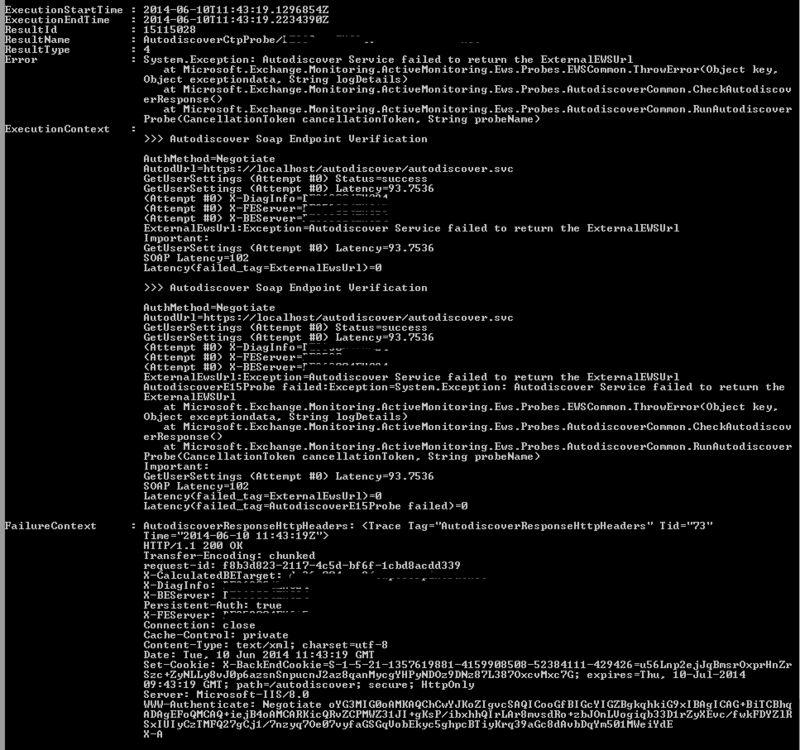 You can see the configuration how the Probe will test the Autodiscover.Protocol HealthSet. You can see the complete error message at “ExecutionContext”. The ExternalEWSUrl value is empty. You have to set the value (it must not be available from the Internet) to avoid Managed Availability error messages. It’s not recommended to disable the AutodiscoverSelfTestProbe and their appropriate Monitors and Responders, because there are a lot of more important tests. So don’t set a global or local override against the Probes, Monitors, and Responders from the Autodiscover.Protocol HealthSet. Update 08/26/2014: Microsoft fixed this "issue" with Exchange Server 2013 Cumulative Update 6 (CU6) and it's not relevant if the ExternalEWSUrl is either set or not. Some HealthSets, such as the FEP HealthSet are local .xml files. FEP is the ForeFront service and some of you would want to disable this HealthSet on the servers. Browse to %ExchangeInstallationPath%\Microsoft\Exchange\V15\Bin\Monitoring\Config, search for FEPActiveMonitoringContext.xml and open the file with an editor, such as Notepad. Restart the Microsoft Exchange Health Management service on the server where you modified the .xml file. You can set overrides: server overrides, which apply to a single server, and global overrides, which apply to all Exchange server within your organization. 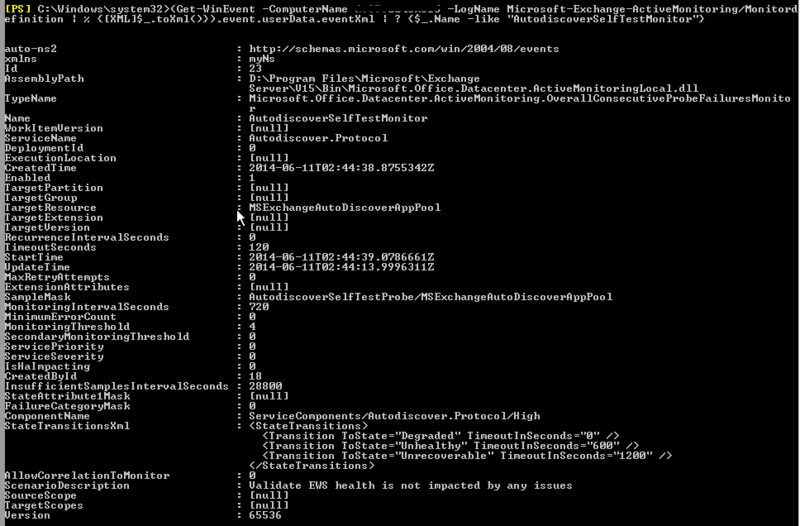 You apply overrides using the Add-ServerMonitoringOverride or Add-GlobalMonitoringOverride cmdlet. Important: you have to disable all the appropriate Probe, Monitor, and Responder! Restart Responder, Rest AppPool Responder, Failover Responder, Bugcheck Responder, Offline Responder, Escalate Responder, and Specialized Component Responders. Today we talk primary about the Restart Responders. But you can also read the entire Managed Availability documentation which is available at http://blogs.technet.com/b/exchange/archive/2012/09/21/lessons-from-the-datacenter-managed-availability.aspx. The thresholds are self-explanatory. The only difference is “Local” and “Group”. Local means one Exchange server, group means more than one Exchange server in your organization. You have to check and configure the setting for your needs. This prevents the server from a force reboot. Enabled must be “0” (instead of 1).